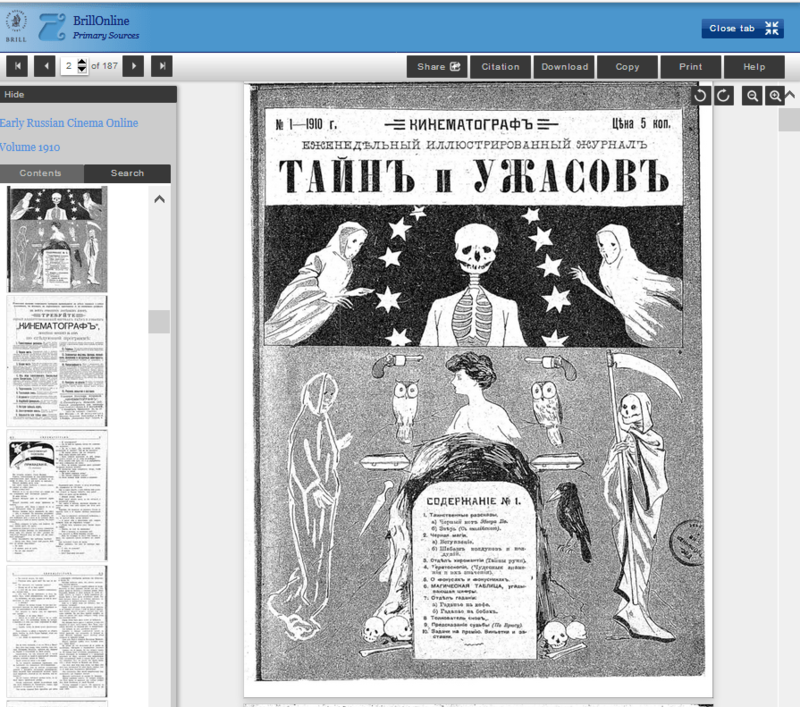 We are happy to announce the arrival of the Early Russian cinema online, an electronic archive of 57 Russian film periodicals from 1907-1918. The collection includes both “serious” and more popular titles produced by the major Russian film studios, film distributors and theater owners. In addition to a wealth of information related to the early years of Russian cinema (including interviews and screenplays), researchers will find information on various genres of live entertainment of that era, such as cabaret, circus and music halls. Among the titles included in the collection are Ėkran i st͡sena : zhurnal sinematografīi i fotografīi, Ėlektro-teatr “Palas” : [libretto kartin], Kino-bi͡ulletenʹ : ukazatelʹ prosmotrennykh kartin, Pegas : zhurnal iskusstv, Teatralʹnai͡a gazeta : ezhenedi͡elʹnoe izdanīe, posvi͡ashchennoe iskusstvu i bytu teatra, Vi͡estnik kinematografov v S.-Peterburgīe : ezhenedi͡elʹnyĭ zhurnal and many others. The database can be accessed by users with a valid Harvard ID via this link. In addition, each periodical title can be accessed directly from the library’s HOLLIS catalog list.